Design Requirements Gathering- "What is important?" It is important for designers to understand needs, expectation and desires of 3 main collaborators- End Customers (Users), Domain Experts and Business Stakeholders. Our designers deploy various data gathering techniques like Psychological Probing, Contextual Studies and surveys to understand human behavior in the context of use of the product. Gathered data is minutely analyzed and converted into qualitative and quantitative requirements. Interested in more details? Write to us or give us a call. Strategic Design- "How should we respond?" Design Requirements present an array of problems and opportunities. Deep understanding of needs of Users, Business Stakeholders and Domain Experts leads to interesting discoveries. Our design experts create an optimal strategy to respond to these. The strategies are validated with stakeholders, reviewed with domain experts and tested on users before they are finalized. Structural Design- "Converting Strategy into a Concept"
A Design Strategy sets overall goals, directives, expectations and approach for design. 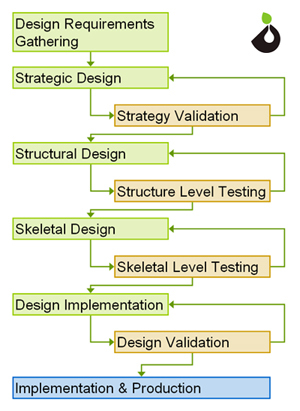 Structural Design converts this strategy into a conceptual blue print of the design, with definitions of all its major functional components, categories and relationships. This proposed Structural Design is tested on end users and iterated for how well it fits their Mental Model. Skeletal Design- "Converting Concept into a Skeletal Prototype" Creating a Skeletal Design is literally creating a 'bones and stick-figure prototype' based on the Structural Design. This phase is a rapid prototyping phase. A lot of ideas are created, discussed, iterated, accepted or rejected. This 'alpha' prototype can be tested and iterated with help of users by conducting Usability Tests. Design Implementation- "Finishing, Polishing and Finalizing"
This step involves giving flesh, skin and clothes to the Skeletal Design. Graphics, visual art, styling, form, aesthetics, colors and all types of attributes that cause attractiveness and desirability are taken care of in this step. This step leads to a high fidelity design prototype that can be tested on users for emotional appeal, perception and brand image. This is the final prototyping step. The design is ready to undergo implementation and production after this.